Right. This is something I've seen being done SO badly at various motorcycle events recently. I'm also bored tonight so I thought I'd do a few simple tips for keeping warm and dry when you are camping. Feel free to add to them. Just stand and look. Any dead tree branches overhead? Big stones underneath? Look at the field, where will water collect when it rains? That flat, grassy bit next to the river, ideal for camping or a serious flood risk? 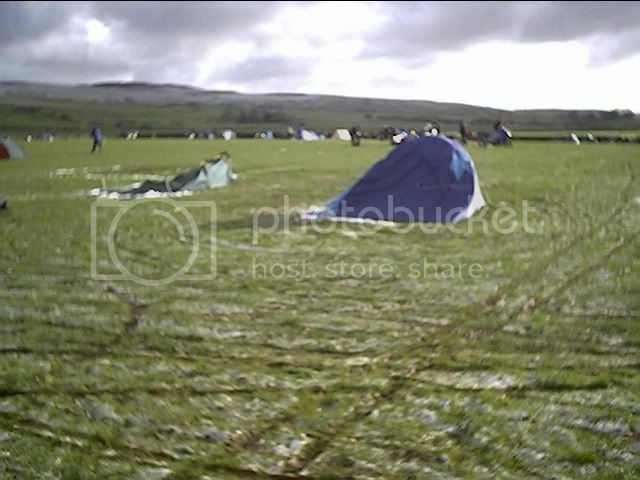 (floods can and do happen, in 2005 the whole rally field at the Farmyard Party flooded to a depth of several feet. Luckily most people had already left. I have friends who lost their bikes, never mind tents that weekend). Look at the prevailing wind direction. Try not to have the door facing in this direction. On a slope? You have to sleep in it you know. Oh yeah, and don't camp next to the toilets! Don't just rock up with a new tent and expect to put it up. Murphys law dictates it will be: a) Dark. b) Windy. c) Raining. Not forgetting: d) There will be bits missing. Put it up on a still, dry day so you know how to and can check it's all there. 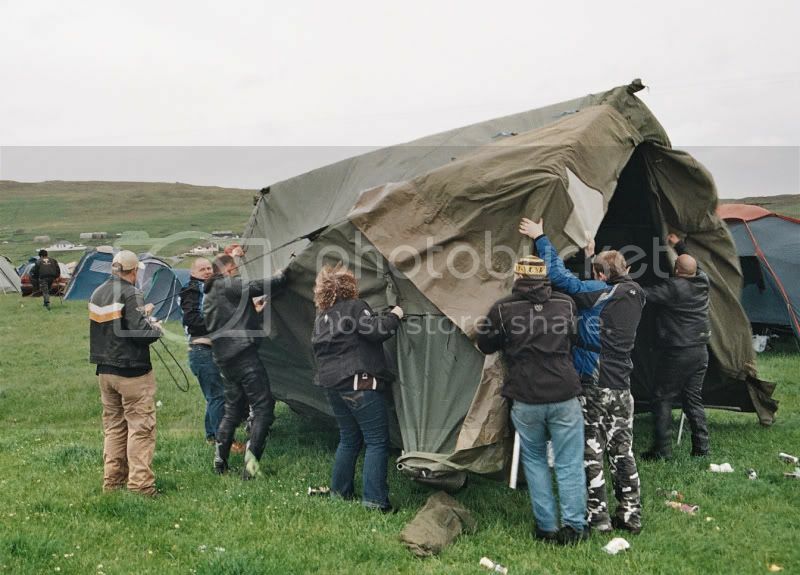 A £20 festival tent, when subjected to driving rain on a windswept hillside is going to leak, fall down or both. A gigantic tent you can stand up in is great until the wind picks it up and wraps it round a telegraph pole. Put them into the ground at a 45 degree angle leaning away from the tent. 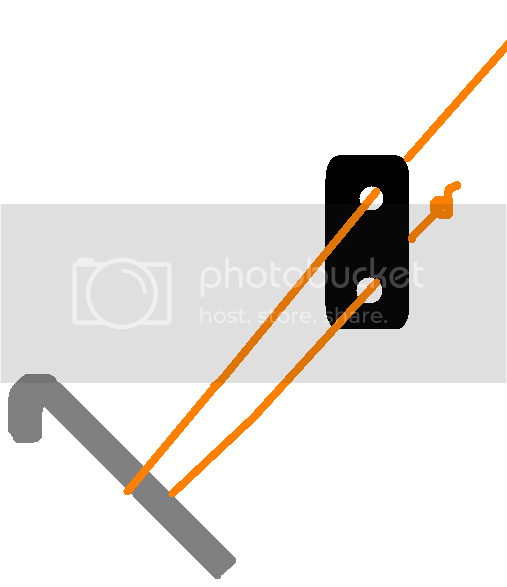 This means if the tent is blown about the force is trying to pull the peg THROUGH the ground, not OUT of the ground. Hitting pegs with a hammer is only going to bend them. You can't hammer a tentpeg through a stone so don't try. Move it a bit so it isn't in the stone instead. If you can't get them all the way in, the ground is probably hard enough to hold them part way in anyway. Ok. Asda are knocking out tents for a tenner. So, you reckon they spent 50p of that tenner fitting them with guy ropes for decoration? Of all the total tent failures I've seen (and I've seen a few). The majority could have been prevented by correctly deploying the guy ropes. Those fibreglass poles aren't all that strong. Bend them too far and they will snap. The guyropes are there to stop them bending too far. First thing is the sliders. These should allow you to tension the guy ropes. They tend to get slack if they get wet or after being up for a while. Tension them periodically. Next thing is the angle to the tent. 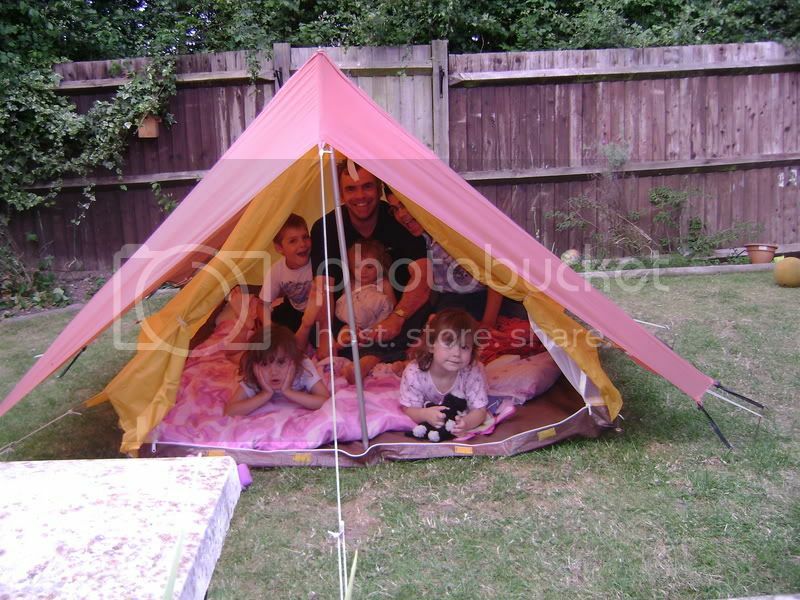 Most people put them WAY too close to the tent because they are afraid someone will trip on them. Just tie a plastic carrier bag to them and they'll be seen. Get them nice and far out so they can take the strain off the poles/flysheet. The guy rope is usually supposed to be perpindicular to wherever it is attached. It is usually joined to the tent on a triangle of fabric. the guy rope would normally continue along the same angle as the triangle makes with the tent. raak This post is not being displayed . Lots of guides to buying the right tent or where to go go camping but little about HOW to actually use the bloody thing correctly. On a side note, seriously considering camping this year. 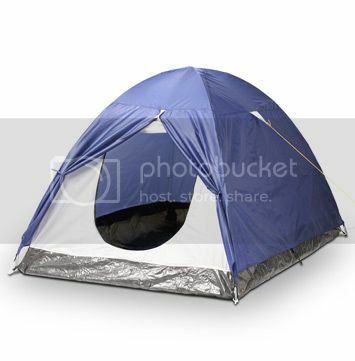 would be nice (particularly for novices like me ) if people could recommend particular tents? a personal experience and recommendation of a product. Stinkwheel, even tho' you were just bored, thanks for taking the time to post. divuk83 This post is not being displayed . Good post. Was at a rally last weekend and there were loads of people with the guy ropes just dangling off the side of the tent like streamers! A lot depends on what you are doing with it. I tend to go for the more extreme end of camping so my tents are pretty robust. Look at the materials it is made of. Aluminium poles are stronger than fibreglass. The fabric should have a "hydrostatic head" figure quoted. This is the height of water that can be stacked on top of the fabric before it leaks. ie, how waterproof it is. Also look at the packed size. Space is all important on motorcycles. You can get spacious, 2-man tents that will fit in a pannier these days if you are prepared to spend the money on them. You also get double and single skin tents. I can think of no circumstances where I would EVER want to camp in a single skinner. Just don't. Hardly used these days. The old fashioned triangular ones. The have rigid steel poles and a long pole running along the ridge. They usually have two poles. Cons: Heavy, old fashioned, large packed size, poles get in the way. Pros: Simple and fast to errect, cheap, proven design. 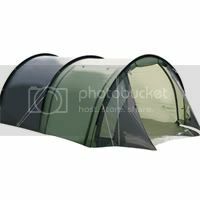 There is an exception to these in the form of the Vango force 10 which has two steel A-frames and a ridge with a canvas flysheet. 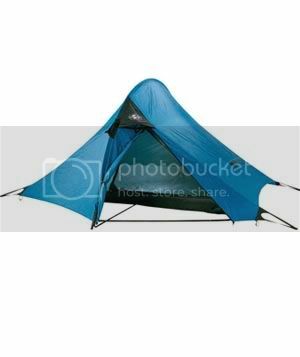 It has an enormous pack size and is ludicrously heavy BUT it is probably the most indestructable tent known to man. There are various versions of them, mine was £30 off ebay, new ones are about £400! There are also what I referr to as 'kebab' tents which have a single, curved pole. 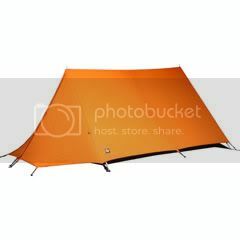 They are probably the smallest, lightest tent you can buy. They are only good for sleeping in and hold one man. They stand up to a wind surprisingly well considering how basic they are. Probably the most common ones you'll see. Two flexible poles, crossed in the middle. With or without a porch. Cons: Tendancy to buckle in a strong wind, even if guy ropes deployed. Tricky to errect in a strong wind by yourself. Most have a funny 'lid' thing to cover the top which tends to go missing. Pros: Cheap, plentifully available, easy to errect, reasonably spacious inside. A good choice for 'leisure' camping. Two or three 'hoops' in a row giving a low, long tent. Cons: Low lying so tricky to move about in. Do not generally respond well to a side-wind, orientation is important. Pros: Small pack size. Ease of errection. Better wind resistance than a dome tent. Good for lightweight camping or where you'll be spending a minimal time in the tent. Some of them have a HUGE porch. Again, Vango make a tunnel tent called a TBS which is a bit of an exception to the rule. It has a clever series of internal "tension bands" that stop it buckling in a side wind. It works, I own one. 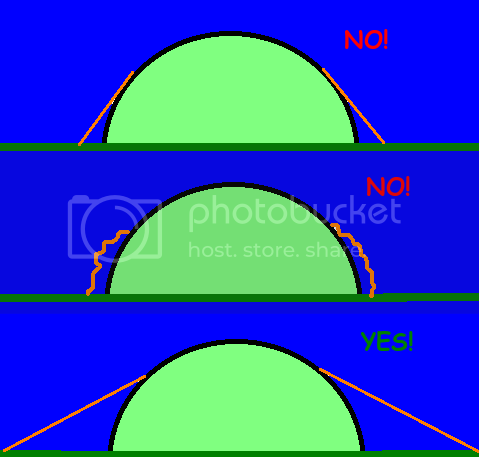 Come in tunnel or dome form. The poles cross in more than one place and there are often additional poles. As a general rule, the more places they cross over, the stronger the tent. Cons: Heavier, more expensive, take longer to errect. Pros: Extremely strong and robust. Inherantly rigid, self-supporting design. Unlikely to fall down even in extreme conditions. A good choice for "all year round" camping. Can include the geodesic ones. Complex designs to give extreme weather resistance or to make them especially lightweight for their size. Often specialist applications and the place you buy them from are probably best to advise you on them. Summing up. I reckon one of the best tents for year round camping on a motorcycle is the Vango Spirit 200 if you can afford one. A 2-man tunnel tent with tension bands. High hydrostatic head, alloy poles, fits in a pannier, huge porch. Can be a trifle fiddly to errect. Also recommended by the Duke of Edinburgh Award scheme. I'd be reasonably confident my last geodesic dome would have stayed up on concrete providing there was enough weight inside it. Deano_44 This post is not being displayed . Looks like there is some sound advice there, will try and remember it! Thanks. barnhatter This post is not being displayed . I use one of thise "Kebab" tents. It was very cheap £17 and has been used quite a few times, once up a mountain in the lake district. It is very small for 2 but ideal for solo touring. Takes 5-10 minto errect and take down on your own. Once packed away fits on my rack between the panniers. I can recomend them for cheapness, simplicity, ease of use, and size. Gelert sell them they are the Nakina plus RRP £35. For sleeping a large mummy bag from Millets, 2 season XXL £25 and an inflatable 6 reed airbed and inflatable pillow. All this does not take up too much room and works very well when on the road. And by the way, well done the Mods for making this one a sticky..
pros/cons about the merits of buying one PLUS your own personal recommendations..
able to ask sensible questions in a camping store. This is a good and very valid point If you start drinking first, it's suddenly dark and your tent still isn't up. On going into shops. 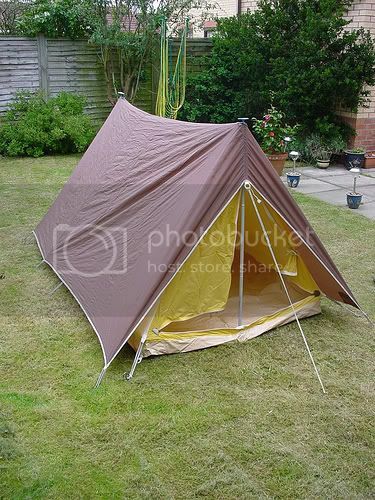 If you are buying a reasonably expensive tent, get them to demonstrate putting it up. If the guy whos job it is to sell tents struggles to do it inside, you've got no chance outside. Also gives you an idea of the size both packed and errected. If they aren't prepared to demonstrate, go elsewhere. truslack This post is not being displayed . The tent I use is almost exactly the same as that (it may even be the same model, not sure) and it has served me well! What about the TeePees dammit! Dunno. They are generally too big to fit on a bike, what with the 20ft long wooden poles and all so I have no experience of carrying one. They are good to stay in if there is a group of you. For the same reason, I didn't include marquees, icelandic and frame tents. I tried one out recently, very cool. 55cm packed diameter for 30 quid. My concern with those, other than the obvious size problem for packing on a bike is how easy they are to put away again? My experience of, admittedly very early, popup tents is that as you try to put them away, they are busy trying to popup again. Kris had one at R+S, packed up small enough to be worn on a pillions back and did go up very easily. It did look like a bit of a struggle to pack away though. Overtook someone carrying one of them on their back on a scooter the other week in France, was very windy and I had visions of the tent popping up on his back and him being pulled back off it as it was a parachute or something! Quite pleased with my cheapo tent. About 30 squid (I think) off feebay several years ago. Packs down very small, in fact its the same size as my sleeping bag, and thats one of the very small lighweight ones too. Can get tent and sleeping bag in a 33 litre top box with loads of room to spare. Just thought I'd add my 2 pence worth. I've got 2 tents. 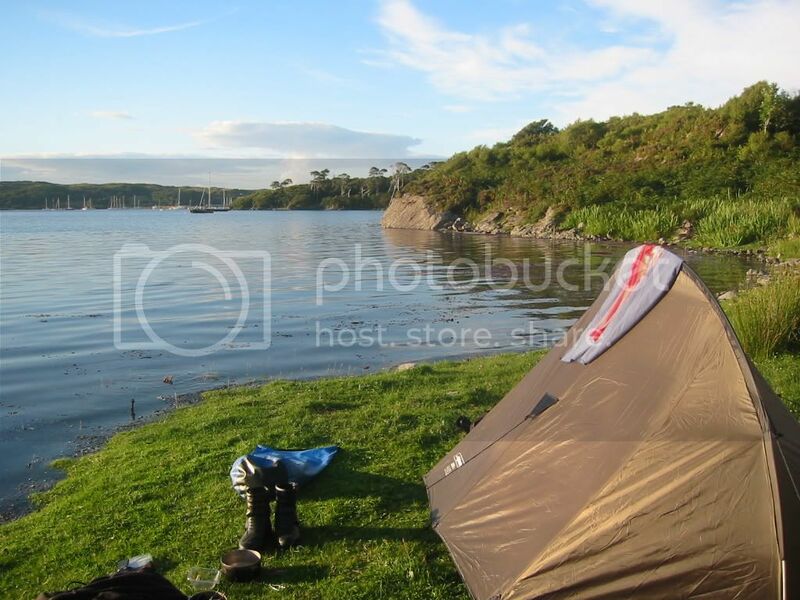 1 of them is the Quechua 2 second pop up tent. It's awesome ... for festivals. It is very waterproof surprisingly and only takes about 20 seconds to put it down once you know the technique. It's just about big enough for 2 people with some luggage but the lack of porch makes it a bit of a squeeze. And, as others have said, it's not suitable on the bike and wouldn't be suitable for hiking either, it's not very comfortable and if it's windy you're gonna get blown about! mikeoldcars This post is not being displayed . 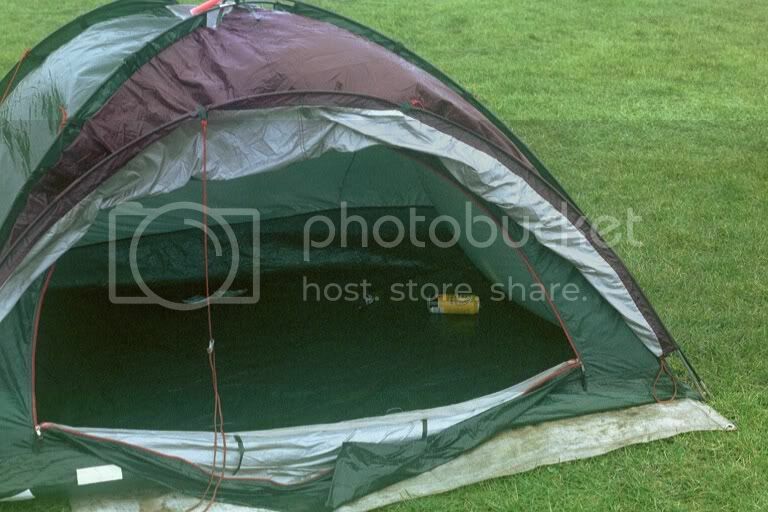 Wow thats my old tent that i had as a boy in the early eighties, it still gets pressed into service in the back garden now. I think in your camping kit you should bring a couple of canvas or thick water proof plastic bags, as in Spain the ground was rock hard and putting up my tent was difficult, with bags if all else fails you can dig up some of the ground and put it in said bags to create some weight to hold things down. Shaane This post is not being displayed . EMRA Roadstock #92 - Paperwork Permitted. Did you try it out in the wet? I've not seen anyone sleep in one of those during a rainshower who hasn't got wet! The Girl Guide in me takes over if I see someone with a badly pitched tent, it gets 'fixed'. Just to add, I was away this weekend and tried out my new, single pole "kebab" tent. Just enough room in it for me and the girlfriend. £25 from Highlander. I'll admit I replaced the fibreglass pole with a spare metal one I had hanging about. Pros Very quick to errect. Very quick to strike. Lightweight, minimal bulk (fits in a pannier). Cons Minimal room inside. Two people sleeping just about does it, kit has to stay outside and no porch. Would be great for one person though. I wouldn't trust it in very poor weather but fine for a blustery, showery summer. Note my mistake of assuming the high tide mark would be the same as it was previously. Wrong, it came in about another 3 feet past the line of seaweed, the grass doesn't usually get wet when you camp on the machair! I was keeping an eye on it though, if you look closely you'll see a peg in the ground marking the water level, that's as high as it got. Bendy This post is not being displayed . Dead easy after a couple of goes. I'm a lazy sod so love my popup tent, the only real issue being that it doesn't fit on my bike or in my car. Demonic69 This post is not being displayed . Had 2 of the exact same style and they've both been brilliant for rallies. 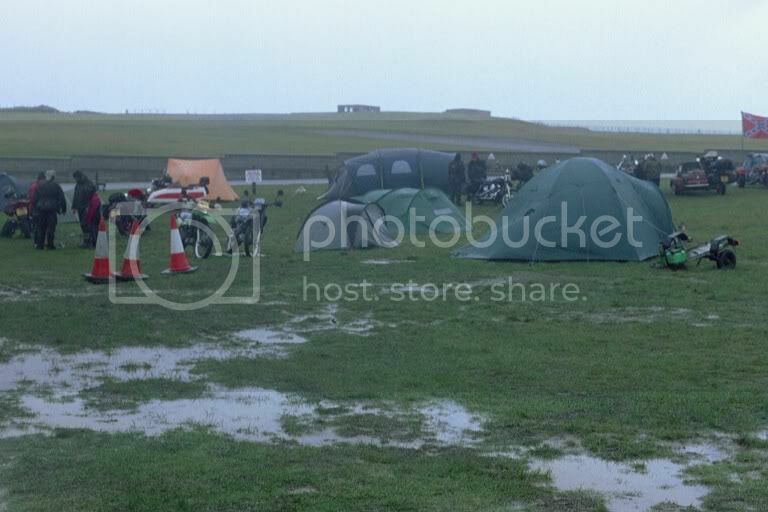 Big bike rallies, Bulldog, RnB etc seem to be decent places to buy tents these days. I bought my last one at Bulldog 07, it was cheap but well made and lasted through the weekend easily enough. Back on a Blade. Just feels so right.